how to get to Cuello de Luna ? Mountain Lodge Hotel Cuello de Luna is a beautiful Country Inn located in the countryside between Quito and Latacunga, between km 319 and km 320 some 600 m west of the Pan American Highway (E35), 6 km (4 miles) from the Cotopaxi National Park main entrance (entrada sur). 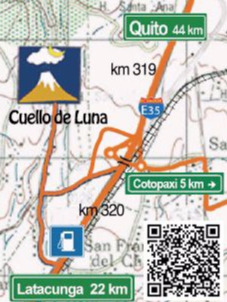 Navigate to Cuello de Luna with Apple Maps , MAPS.me or Google Maps. Please be aware that on Google Maps the access road to Cuello de Luna from the bridge at km 320 km is not accurate, for details please check the scetch below and the pics of the access roads and trails. Private Transport Service to Hotel Cuello de Luna from Quito, Tababela Airport, Lasso, Latacunga, Mindo etc. can be arranged and provided upon request. Take the Highway E35 (Panamerican Highway) south, in the direction to Latacunga ( > Avenida Simon Bolivar > Tambillo > Machachi > Cotopaxi). About an hour south of Quito just before km 320 (after the Exit Cotopaxi and some 80m after the bridge which goes over the Highway to Cotopaxi National Park entrance ), you will see our sign on the right. Turn right and enter the unpaved road, follow straight for 700 m to the crossroad, turn right (north) and follow the dirt road for 700m to Hotel Cuello de Luna, see pictures. Take the Panamerican Highway (E35) north on the way to Quito, at Km 320 follow the exit ramp "Cotopaxi National Park", cross the bridge to merge the Panamericana back to Latacunga. 80m south of the bridge, at our sign, turn to your right and follow the small unpaved road for 700m to a crossing, turn right (north) and follow the dirt road for another 700m to Hotel Cuello de Luna, see pictures. If you missed the entrance at our sign, stay on E35 for 1km and turn right 50m after the gas station, see pictures. Public Transport: How to get to Hotel Cuello de Luna with public transport ? From Quito, Bustation Quitumbe: take any Bus to either Latacunga, Ambato, Baños or Riobamba. Ask the driver to drop you off at km 320. That is right after the Concrete Bridge which crosses the highway 300m after the exit ramp "Cotopaxi National Park". (to your right) for about 700m, at the intersection (second sign) turn right again and follow the dirt road for another 700m to Cuello de Luna, see pictures. From Otavalo and Ibarra take a bus from "Cita Express", this company passes quito on the ring road, no lost time and hassle changing bus station in Quito. To get to Hotel Cuello de Luna from Latacunga, Ambato, Baños or Riobamba take any Bus to Quito and get off at the concrete bridge just before km 320 (exit Cotopaxi National Park). 80m south of the bridge you will see our sign on the dirt road leaving the Highway to the right, follow the dirt road west for about 700m, at the intersection (second sign) turn right again and follow the dirt road for another 700m to Cuello de Luna, see pictures. If you requiere pick up service, please give us a call on time (+593 999700330 or +593 33053898 or +593 999727535), indicating arrival time and we gladly arragne or provide pick up service from the Panamerican Highway km 320 ( $ 3 per vehicle, up to 4 persons ). We gladly arrange or provide private transport to Hotel Cuello de Luna from Quito, Tababela Airport, Lasso, Latacunga, Mindo etc. upon request.